Ancient Egypt is familiar territory for fans of online slot machines and even if you don’t win they’re always an opportunity to learn a little more about the various deities worshipped all those centuries ago. This particular machine is called Egyptian Rise, it’s developed by Nextgen Gaming and you can read all about it below. 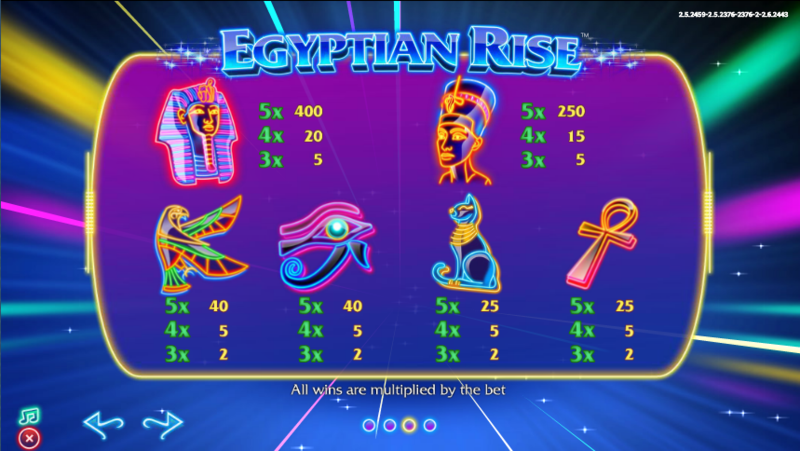 Egyptian Rise is a five reel slot with three rows and 243 ways to win; there’s no payline structure and you can form winning combos as long as there are matching symbols in adjacent reels starting from the left hand side. There are no pyramids or hieroglyphs on show here – it’s more of an ethereal neon scene behind the reels. There are six theme-related symbols which comprise various gods and symbols – Anubis, the Eye of Ra, an ankh and the like; the wild symbol is a scarab which appears on all reels and will substitute for all others to form winning combos. The gameplay is largely based around this feature and very clever it is too; each win will trigger one free respin with an extra wild added to the reel set. If you don’t win then the number of wilds on the reels is reset but if you can land four winning spins in a row the Pharaoh Feature will be triggered (described below). Once you’ve landed four wins in a row this feature is triggered and it’s a free spins round; five extra wild scarabs will be added to the reel set and the spins will continue until you have made three non-winning spins – these are signified by the ‘Pharaohs Remaining’ meter. 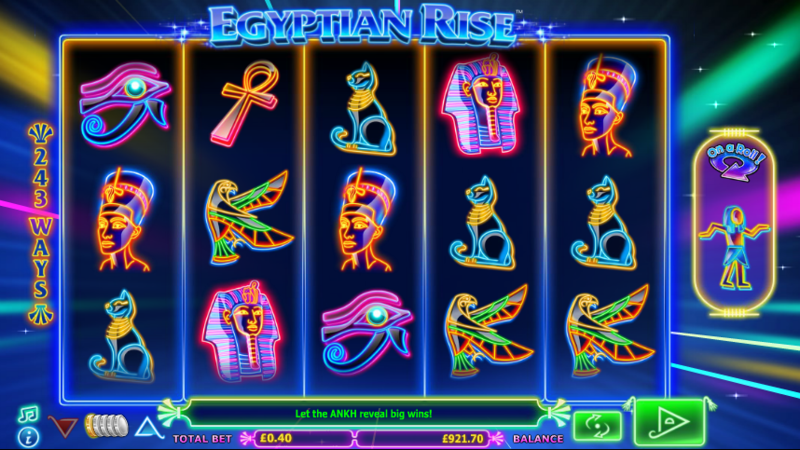 Egyptian Rise is a very good-looking slot with some creative gameplay and some big wins if you can land subsequent wins – it come with a nice high RTP of 97.76%.